For the second straight game in Atlanta, the Wizards could not find the right ingredients to get a must needed victory to take the series back to D.C with a 2-1 lead. Instead after a 111-101 loss tonight, they return home tied at 2-2 with the Hawks getting a commanding hold of the pace in this series. Bradley Beal scored 32 points, bouncing back from a dismal performance in Game 3, and John Wall had another stellar performance with 22 points and 10 assists. But those two, as good as they were, couldn’t match a more balanced approach by the Hawks. They just need to find a way to create a balanced act of scoring and defense at the same time. No more blaming it on the refs, as tonight they just clearly let them play basketball and the Hawks proved to be the stronger team. Millsap and Schroder stretched back to 10 points the margin on back-to-back possessions late in the fourth quarter. Millsap grabbed an offensive rebound and managed to get the shot off while falling on his backside. The ball dropped in and he added the free throw for a 3-point play. Schroder followed with a 3-pointer, giving the Hawks a 103-93 lead with 4:30 remaining, which would be just enough for the Wizards to make one more run, and get to within 5 points, but that was a close as it would come. 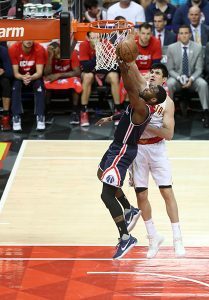 ” I thought we played extremely tough tonight, there were a few calls that weren’t made, but Atlanta played a strong game and now we have to go home and try and get started again,” said Wizards Head Coach Scott Brooks.